©1994-2016 Take-Two Interactive Software, Inc. Take-Two Interactive Software, Inc., 2K, Firaxis Games, XCOM, XCOM2, and their respective logos are trademarks of Take-Two Interactive Software, Inc. Unreal® Engine, Copyright 1998-2015, Epic Games, Inc. All rights reserved. Unreal® is a registered trademark of Epic Games, Inc. Uses Bink Video. Copyright © 1997 – 2015 by RAD Game Tools, Inc. This software product includes Autodesk® Scaleform® software, © 2015 Autodesk, Inc. All Rights Reserved. Portions hereof © 2002-2015 by NVIDIA® Corporation. All rights reserved. Facial animations generated with FaceFX. © 2002-2015, OC3 Entertainment Inc. and its licensors. All rights reserved. All other marks are property of their respective owners. “PlayStation” and the 'PS' Family logo are registered trademarks. 'PS4' is a trademark of Sony Interactive Entertainment Inc. 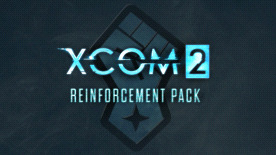 Please note: Requires XCOM 2. Game sold separately.